It’s late summer and two bugs discover what they agree is the most beautiful peach of the summer, perhaps of all summers. They pause to admire the peach, and to plan their eating of it. Other bugs drop in to offer their opinion on the eating of this fine peach, including why the bugs should just leave it alone. Illustrations use collage, including magazine, newspaper and book cutouts, mostly in French. Each character has their own text colour, so no attribution is required. This also allows easy personalising of each character. (French-accented mosquito anyone?) This allows the spare text to sing. And sing it does. The reader is eavesdropper to this apparently simple conversation between friends as they agree, disagree, take advice, reject advice all in quick succession. It’s also hilarious. 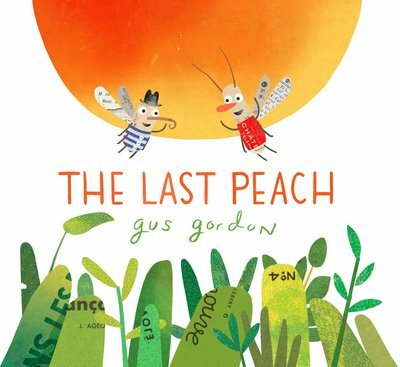 From the perfect peach of the front cover, through the realistic peach endpapers, to the thoughtful and hungry bugs, this is a delightful picture book perfect for sharing with young readers.